It was the spring of 2009, and I was visiting my friends Neal and Danielle in Massachusetts. They both had to work one day, so I decided to go to Cambridge on my own and take a look around Harvard. 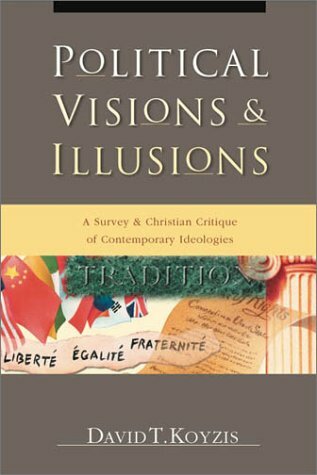 While I was there, I felt the irresistible pull of a used bookstore and found Political Visions & Ilusions: A Survey and Christian Critique of Contemporary Ideologies by David T. Koyzis inside. I immediately snapped it up, but didn’t make time to read it until this month. What I found was an excellent overview of five popular political ideologies: liberalism, conservatism, nationalism, democracy, and socialism. Koyzis, who teaches political science at Redeemer University College in Ontario, examines each of them from a Christian perspective and finds them to be incomplete understandings of the world God created. That is because “every ideology is based on taking something out of creation’s totality, raising it above that creation, and making the latter revolve around and serve it. It is further based on the assumption that this idol has the capacity to save us from some real or perceived evil in the world” (15). In other words, ideologies are modern idolatries. We commonly think of idolatry in terms of its ancient manifestations: worshiping a literal idol that represents a god who exerts control over some aspect of the physical world. But that is only the shape idolatry took in the ancient world; idolatry in its modern forms is still with us. Idolatry is taking a contingent thing and turning it into an ultimate thing. I’ve heard it attributed to Augustine that “Idolatry is worshipping anything that ought to be used, or using anything that is meant to be worshipped.” This means that even nominal believers in God may be idolatrous, in the sense that while they profess to worship God, they may actually serve success, political power, or any number of other things. Source of evil: Any involuntary authority that can be imposed on an individual. What it makes a god: Individual freedom. Eschatology: A society where each individual pursues rational self-interest, and the only contracts we are obligated to are ones we enter voluntarily. Liberalism is by far the most popular ideology in the United States. Both the Right and the Left subscribe to different versions of it; they are just at different stages. “Conservatives” are conservative in that they want to return to an earlier form of liberalism. Those on the Right subscribe to classical liberalism, whereas those on the Left subscribe to what Koyzis calls “late liberalism.” Last year I often heard the Tea Party and the Occupy Movement insisting that they had nothing in common, but that’s not strictly true. They’re both liberals; they’re just at different stages of liberalism. Source of evil: Grand schemes for the betterment of society that ignore what the past has taught us. What it makes a god: Tradition. This means that conservatism varies from place to place. In the United States, as noted above, conservatism simply tries to preserve an earlier form of liberalism: the kind originally articulated by John Locke and others, and interpreted by the founding fathers of the United States. Eschatology: A society which looks to tradition as a source of norms, and in which we have respect for tradition, and humility regarding the effectiveness of new proposals. Unfortunately, conservatism as an ideology has no way of evaluating new proposals other than criticizing their novelty. Source of evil: Being ruled by someone unlike oneself. This applies to any kind of interference of one sovereign state by another, up to and including colonialism. What it makes a god: the nation, of course. Our nation. Eschatology: A world in which each nation commands the ultimate loyalty of its citizens, and each nation is able to be self-directed, without outside interference. Source of evil: Being ruled by anyone else. What it makes a god: The voice of the people. But not all people; the majority of the people. Eschatology: A society in which those who have any authority on behalf of the people are in some sense following the will of the people. This includes not just government, but non-governmental institutions as well, like church and family. By the way, Koyzis draws a distinction between democracy as structure and democracy as creed. It is democracy as creed that is an ideology. Source of evil: Inequality brought about by the division of labor. What it makes a god: Material equality. Eschatology: A society which embraces communal ownership of property by a class, leading to the elimination of the oppression of one class by another. This, according to Marx, will be the consummation of history. All of these ideologies get something right about the world; otherwise they would not have so many followers. But what they get wrong, according to Koyzis, is that they begin from the standpoint of human autonomy. They emphasize self-direction; governing yourself according to a law that you choose. This means that they are not just ideologies; they are idolatries. They take God out of the picture, or worse: they turn him into something that the sovereign individual can choose or not choose to worship. God is not the sovereign Lord of creation; he is just another option on the menu. But I would not go so far as to say that anyone who identifies herself as a liberal, or a conservative, or a socialist, or any of the other ideologies, is automatically an idolater. It is not common to find someone who follows any of these ideologies in its purest form. Most people realize, whether on a conscious or subconscious level, that an ideology cannot make complete sense of the world as they experience it. These ideologies do become idolatrous, however, when a person truly puts his hope in that ideology, rather than in God, to bring about justice in the world. And that varies from person to person. All this has been a rough sketch of the main part of Koyzis’ book, combined with my immediate reactions to it. For a more nuanced discussion, I highly recommend reading the book. I think it would be helpful to any Christian who is seeking to make sense of politics, especially in the North American context. Thanks Elliot. Very nice definition of idolatry for the uninitiated, and I like your summary of how the book describes idolatry in the different political arenas. I am writing a book about something I call “Corporate Idolatry” which is excess devotion to the corporate employer, such that work is prioritized over people. Idolatry is a very powerful concept, and I’m glad to see you writing about it.